You are currently browsing the tag archive for the ‘inner’ tag. If you wanted to build a vacation home with a truly spectacular view, one of the possibilities you might consider is Jupiter’s moon Amalthea. Discovered in 1892 by the American astronomer Edward Emerson Barnard (who also discovered Barnard’s star) Amalthea was the first Jovian moon discovered by someone other than Galileo Galilei. 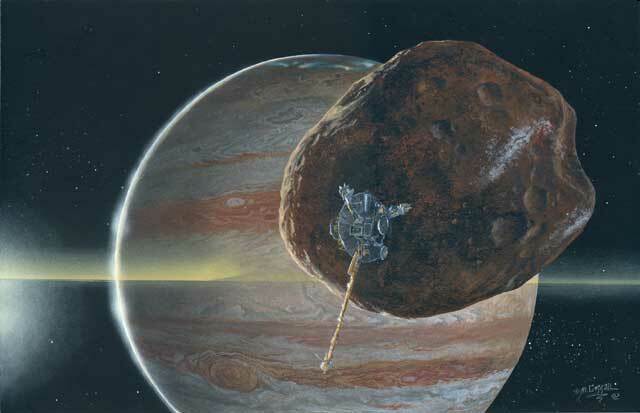 Amalthea is the largest inner satellite of Jupiter and from its surface Jupiter would appear to take up 46.5 degrees of the sky (from the horizon to directly overhead is 90 degrees). Amalthea is in synchronous rotation around Jupiter and so the planet would always appear in the same part of the sky (provided you were on the right part of the moon). From Amalthea the sun would disappear behind the planet’s bulk for an hour and a half each revolution. The 66 known Jovian moons are largely named after the lovers and children of Jupiter/Zeus, however Amalthea is an exception: it is named for Jupiter’s step-mother the goat/nymph Amalthea who fed and cared for the young god as he quickly grew to adulthood and whose impervious skin was fashioned into the aegis of the king of the god. The name Amalthea was used for the moon almost since it was discovered but was only formally adopted by the International Astronomical Union in 1975. 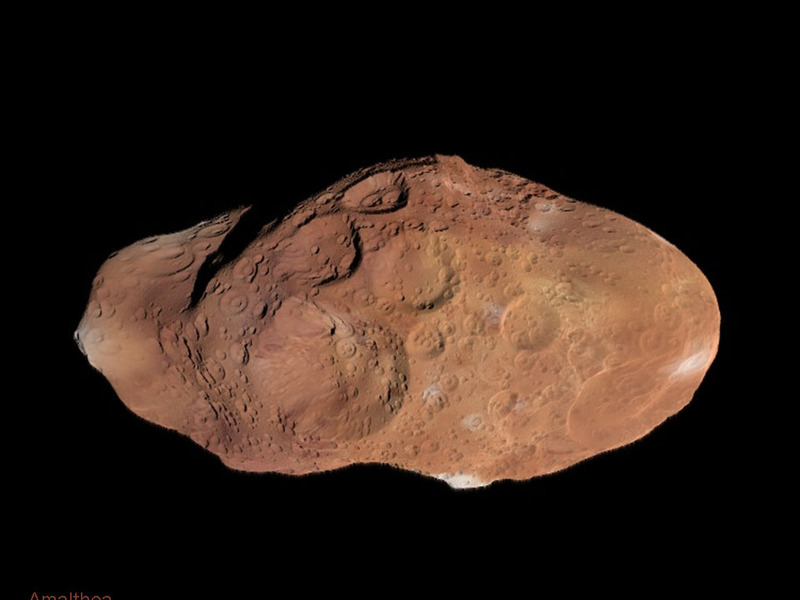 Amalthea is a strange and mysterious moon which perplexes astronomers. Its irregularly shape is somewhat like a potato and it is covered with deep craters and tall mountains. The surface of the moon is deep red in color (in fact Amalthea is the reddest object in the solar system) however weird bright patches of green appearing on the mountain slopes–the nature of which is unknown. The moon appears to be formed of ice and rubble, but if had formed where it now is during the early days of Jupiter, it would have melted. 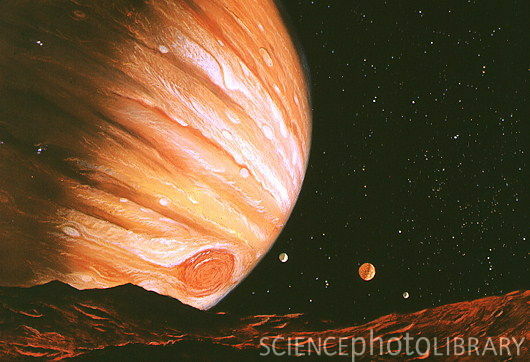 The moon must have formed elsewhere and been captured by Jupiter—a recent paper speculated that it was originally a Trojan asteroid. Since Amalthea is made of ice and heterogeneous rubble scientists are perplexed at why gravity has not rearranged its into a more spherical shape. Since Amalthea is so close to Jupiter it’s orbit is decaying and it will one day fall into the gas giant (so you may want to get really good insurance on the vacation house I mentioned in the first paragraph).